There's a whole lotta activity in the animal kingdom around our house lately. 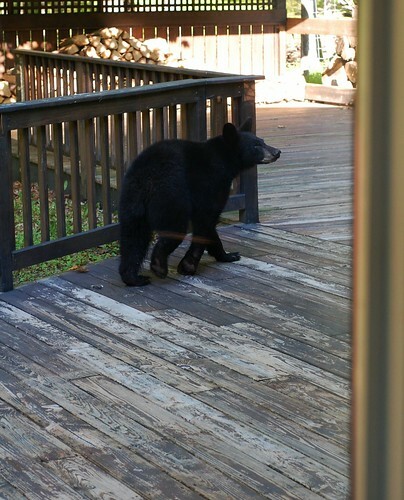 We had a surprise visit from a young black bear the other morning. Here he/she is ambling along on our deck, taken very hastily through the window behind our couch. I'm hoping it was a one-time visit as it's way too close for comfort with two small kids playing on the deck all the time. In my quest for bear deterrent strategies, I've gotten advice including a shotgun loaded with rubber bullets, a flare gun, an air horn, an electric fence, and leaving spicy food out (but what if the bear likes it hot?) For now, I've ordered this air horn in case we see him or her again, swept the deck of any fallen food since that is undoubtedly what drew him/her, and have my fingers crossed that our ursine friend stays in the woods. 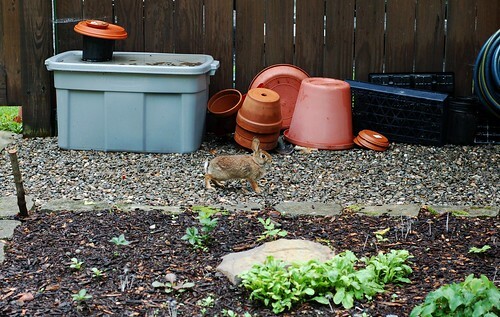 There are several adorable, little eating machines bunnies who've been systematically decimating our flowers, ferns, and hostas. 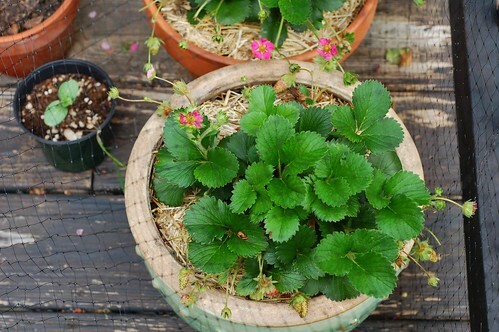 They even chewed up all the potted succulents I'd moved outside for the summer. Buh-bye, jade plant. Buh-bye spider plant. Buh-bye string of pearls... I am seriously considering shooting them and eating them but am not quite sure I can work myself up to committing acts of violence. 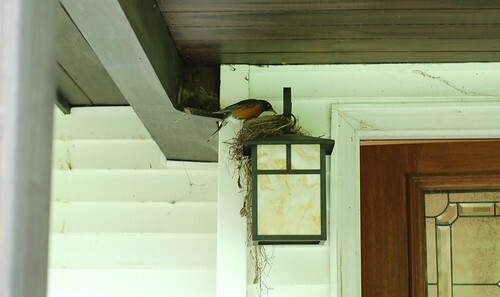 There's also a pair of robins who have taken up residence in a nest that was just abandoned about a month ago - not something I'd ever heard of them doing but there they are. Whenever we open the kitchen door, there's this panicked flap of wings as they fly off, then settle a short distance away and squawk angrily at us until we leave. I like watching them forage for food - they're remarkably good at it. And there are chipmunks galore. My personal theory is that the boom in hickory nuts last fall fueled their population explosion this spring and summer. They somehow manage to eat the strawberries right through the netting we put up... But they're usually too quick to allow for good photos. How Can You Get Fresh Herbs? Plant Them!